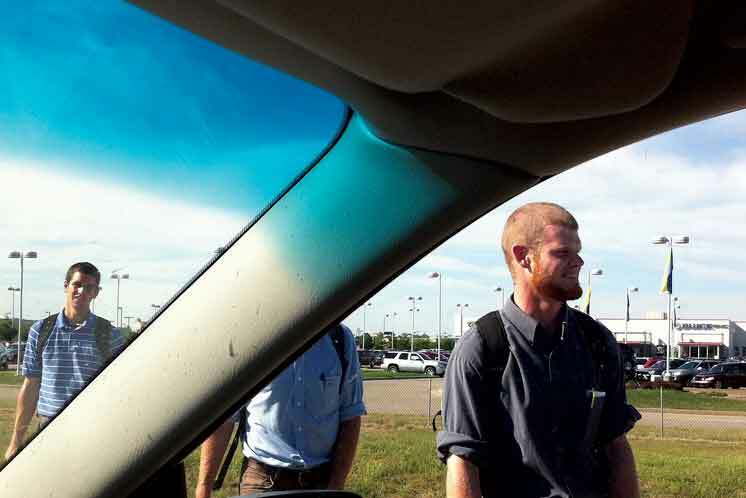 The Evansville missionary men finished their third of three hitchhiking trips through the cities and rural towns of southern Indiana in mid-September. In the spirit of Jesus’ earliest disciples, they set out without food or coin. They carried only a few possessions—Bibles, songbooks, water bottles, cell phones and one change of clothes each. 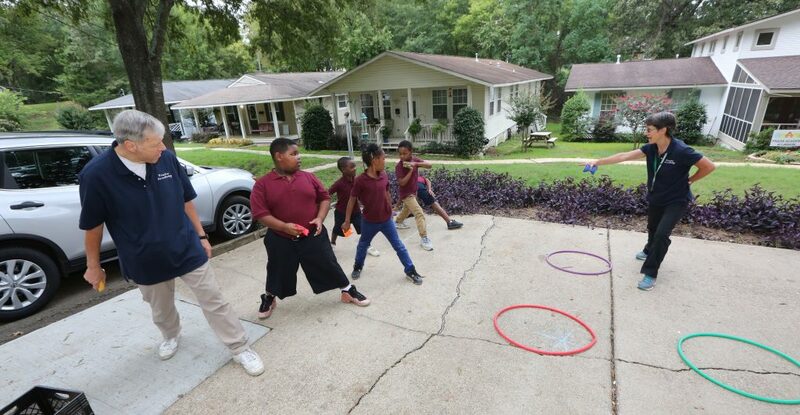 They begged meals, rides and places to stay, offering strangers in towns like Chandler, Booneville and Rockport the same prophetic message: God wants to unite everyone in the Mississippi Valley in Christian community. They came through the trips healthy and with stories to tell—of impromptu prayer meetings held in kitchens and dining rooms, of strangers prayed with for healing or baptism in the Holy Spirit, of fellow Christians who took care of them along the way. “We never slept outside and we never missed a meal,” notes Rus Lyons, who led the trips, which involved three missionaries each. Along with Rus, Joe Bulger, Peter Coleman, Ryan Hardin and Peter Putzier participated. All told, the men prayed with more than 15 people to be baptized in the Holy Spirit, led two teenagers to dedicate their lives to Jesus, and witnessed a woman healed of chronic pain. Sometimes the timing of their arrivals was better than anyone might have planned. In Terre Haute, in mid-July, during their first trip, they dropped by a campus ministry building near Indiana State University, and found six students who had been discussing living together in Christian households. The missionaries proceeded to lead several prayer meetings for students and prayed with one man for baptism in the Holy Spirit. Later, in the same city, they were knocking on a door when a woman fell from her bicycle and spilled a backpack full of groceries onto her front lawn. “Are you Christians?,” the woman asked as the missionaries helped her pick up the food. “I saw you knocking and knew it was the Lord who sent you.” The missionaries prayed with the woman and her son to be baptized in the Holy Spirit. Another Terre Haute woman invited the missionaries in for a meal, where they were joined by various relatives and friends. They discussed Christian community and ended the evening singing and dancing together around the dining room table. Their second trip took them to Washington, Indiana, where a man told them that he had been praying for several months about living with other Christians. He asked to come visit the missionaries in Evansville to learn more about community. Several people in Washington told them about Matthew, a serious Christian interested in community. The missionaries located his house, where Matthew and his wife invited the missionaries in for a meal with three friends. Later that night the group asked the missionaries to teach them how to have a prayer meeting. All five asked to be baptized in the Holy Spirit and several in the group spoke in tongues. Later, Matthew called Rus to tell him about the ripple effects. He had prayed with 10 people at his church, and those 10 had prayed with many others in their congregation. On the third hitchhiking trip, a woman named Angela drove the missionaries to Dale, Indiana (pop. 1,200). As they drank Powerades she’d bought them, they explained their goal of finding people the Lord had been preparing for Christian community. “You’ll find the people you’re looking for today,” Angela said. The men also prayed with her for wisdom in raising her 15-year-old son. That night, the missionaries were getting hungry and wondering where they would stay. As they walked the streets praying, they came upon a man, Peter, building the framework for a wooden deck. They asked for some food, and Peter’s wife, Carolyn, agreed to make them a meal and to put them up. The men spent their evening helping Peter with his deck and talking with Peter and Carolyn about baptism in the Holy Spirit. Carolyn had already been prayed with, but the men prayed with Peter for baptism in the Spirit and prayed with Carolyn for chest pain, wrapping up their prayers around midnight. Carolyn was feeling well enough to complete a 5K race the next morning. I'm glad we're being so charismatic, carrying on one of the earliest traditions of our community to speak the Word with power and baptize whoever asks in the Spirit. Go forth, guys! Glory! What a blessing it is to hear about what the Lord is doing on the mission front. God bless you brothers as you continue to hitchhike. Awesome! Way to go brothers keep spreading the Kingdom. We all are praying for you. I am so grateful that these courageous men are doing this work "on behalf of all of us". It is an honor and an inspiration to be united with such dedicated, holy and faith filled brothers. Glory! and all the people they meet. You are living the life that a priest, Fr. Mateo, once described: "An apostle is a chalice full of Jesus which overflows onto souls". Thank you! No wonder we are lead every day to pray for our Missionaries. We ask the Lord to make their (our)work Fruitful, and to protect them. We miss you guys, but know it is the Lords work. It is encouraging to hear about community members following the leading of the Holy Spirit with daily freshness...not to mention courageousness and love of the people he is calling us to gather in some way in the Mississippi Valley. It inspires me to have similar openness in the area where God has me living and working in our community! What a great example of how the Lord works in the world today. Thanks for your example of complete reliance on the Father's providence. I think I'll go home today less worried about the little things and more aware of God's awesome power! Dear Guys, Thanks for the up-date. Missionary hitchhiking must be a two-way street. You preach the Lord to others but their accepting your word must be a kind of preaching to you. In both situations, the Lord is revealed. "Our Lord calls us to be a light to the nations, to be a holy poeple, to eb a community of praise, to particapte in teh mission of the chruch in our times, and to live our lives communally untile the day when Jesus will be all in all." You missionaries are living that so vibrantly! Your stories, expereinces and sacrifices inspires me to share the Lord more noticably in my environments. In a sense we are all "hitchhiking through life." God bless & keep you. I am so glad to be a member of a community that is so missionary conscious and gladly join in praying for these bold Christian brothers and sisters. Like in the case where the missionaries helped that man repair his porch and received shelter and food.Shared responsibilty is community in action and makes one more trusted and believable.What a blessing we are to one another! I see I'm #17 to respond and all I can really do is sum up the previous 16 and say "AMEN"!! God bless you brothers -- and all the missionaries! Praise God! Thank you for standing in faith and ministering to those whom the Spirit led you to encounter. You are our front line! Glory! It took me a few days to get a chance to read this but it was worth the wait. I am really inspired. My family and I will continue to pray for you and the people the Lord sends you to every day! Reading this has been the highpoint of my day , my week - I'm sure the 'praise-responses'will be multiplied ! I join in what Brother C.Fraga shared -I hope the Lord will let me be more a 'missionary' where I live !